A part of the INGenWeb Project...Since 1996, dedicated to keeping genealogy free. Many thanks to Karen Creamer, the long-time County Coordinator for Franklin County. We greatly appreciate her many years of dedication and hard work! Welcome to the Franklin County, INGenWeb site! Come on in and look around; there's a lot of research material here. Use the menu links on the left and start exploring! Interested in volunteering to host this INGenWeb county? Click here! Franklin County was the sixth Indiana county, formed in 1811 from Dearborn and Clark counties. The county was named for Benjamin Franklin. 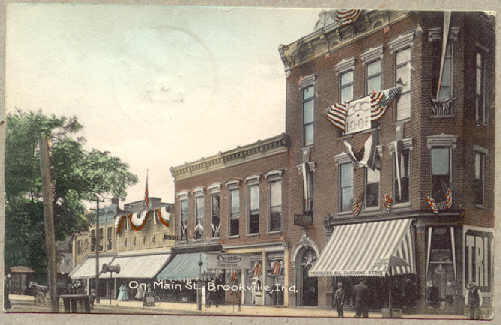 Brookville is the county seat. It was first settled in 1804. A person is considered a Franklin County "pioneer" if they resided here on or before 31 Dec 1825. There are 13 townships in the county: Bath, Blooming Grove, Brookville, Butler, Fairfield, Highland, Laurel, Metamora, Posey, Ray, Salt Creek, Springfield and Whitewater. Four Indiana governors had Franklin County connections, as did a governor of Kansas, one of Utah and one of Wyoming. Added Delilah ALLEY to the Brick Walls page. Added listing for Reid Cemetery to the Cemeteries pages. Updated listing for Martin Cemetery on the Cemeteries pages. Added 2014 entries to the Restored Cemeteries page.